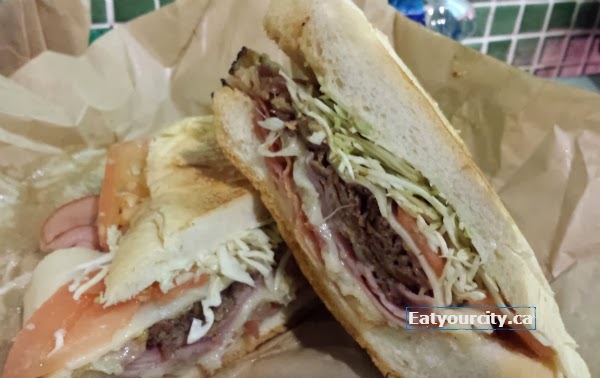 Eat Your City: El Meson Sandwiches San Jaun, Puerto Rico - Amazing sandwiches at Peurto Rico's first chain alternative to fast food restaurants! El Meson Sandwiches San Jaun, Puerto Rico - Amazing sandwiches at Peurto Rico's first chain alternative to fast food restaurants! Posted by Starting off as a humble family run deli offering hot sandwiches in Aguadilla, Puerto Rico back in 1972, this Caribbean style sandwich joint expanded and grew over the years into a tasty franchise that will likely enter the main US market soon (and not soon enough!)... for a chain restaurant, we soon found out why Puerto Rican's were so proud of El Meson serving up delicious sandwiches... because the sandwiches are freaking delicious!! When we arrived at San Juan's airport in Puerto Rico at an ungodly hour, line ups were already out the door at 6am when this franchise location opened. We were totally missing out on something and if the place is jam packed and line ups are already out the door at 6am, this was a place we'd have to try out! We were bleary eyed after staying awake for 36 hours... well, by boyfriend took naps, but I elected to stay awake throughout our flight and transfers and waiting for transfers up from Canada... so a nice cuppa caffeinated bliss was on my list of must haves. There are juices and milk, but we zero'ed in on the sign that read "100% Puerto Rican Coffee". We struggled with the language barrier a bit as most folks were ordering in fluent Spanish.. and I was left pointing and trying to remember Spanish numbers I learned way back in the time of watching Sesame Street eons ago. 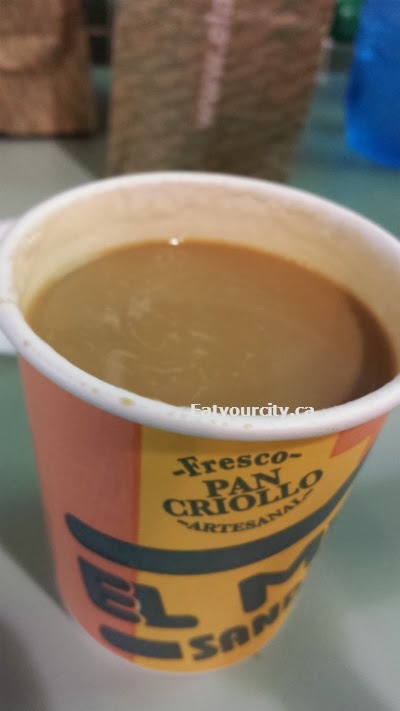 The Puerto Rican coffee is actually an espresso.. a very large cuppa espresso... they make a douple/triple? espresso shot.. sugar and milk is available on the side (both which I added)... the rich roast was a nice was to shimmy up my tired eyes and wake up my brain. Surprisingly with that much espresso it didn't knock my socks off.. but maybe it was the staying awake the last 36 hours... maybe, just maybeeee... *slurp*. Since it was just the two of us, and our bellies weren't fully awake yet (nor our brains) we skipped over the massive mountains that were the breakfast platters, and went with a breakfast sandwich. The breakfast sandwich blew our expectations away with a nice freshly fried egg, sweet and savory slices of Virginia ham, melted cheddar cheese and a touch of creamy margarine all held inside some delicious baked fresh daily Criollo Artisan bread that spent some time toasting to perfection in a panini grill. The super crispy exterior of the bread is contrasted by the soft and slightly sweet bread inside. Hands down one of the best breakfast sandwiches at any type of chain joint ever. We also tried the All Pro sandwich, which is found on their speciality menu. On a bed of shredded cabbage, mayo and margarine is piled with a thick layer of thin slices of super lean Virginia Ham (97% fat free), pastrami, sauteed onions, all topped off with a tomato slice and melted Swiss cheese. The picture just doesn't do this hot crispy awesome sandwich justice. With a huge menu of breakfast items, gluten free and vegetarian sandwich, wraps and soups made with good quality ingredients and freshly baked bread... 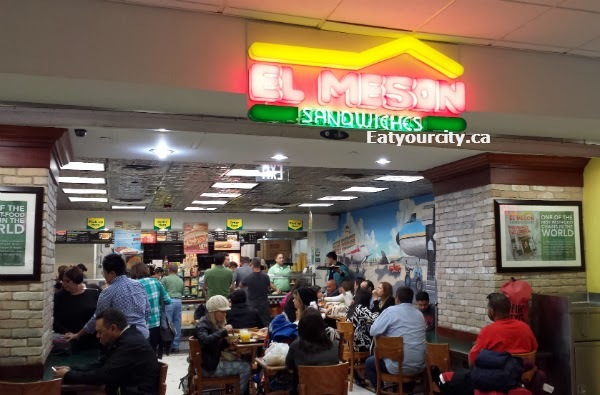 I can't wait till El Meson makes its way into the "mainland" US and eventually, Canada as well!